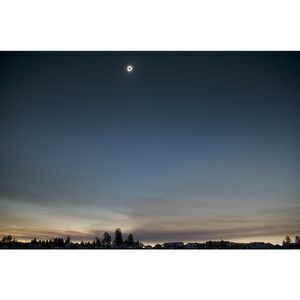 Taken by landscape & amateur photographer and ASP Director of the Teacher Learning Center, Brian Kruse, this gorgeous 12”x18” limited edition (20 prints), signed print features the August 21, 2017 solar eclipse as seen and taken from the Indian Trail Spring on the Ochoco National Forest, Oregon during the Oregon Star Party. This print is provided with a white archival matt, ready to frame. Proceeds from the sale of this print support the teacher scholarship fund for the Teacher Learning Centers' Summer Astronomy Institute.